Instantly Download this chalkboard 60th Birthday Invitations template! The number 60 sits on either gold, silver, red, green or blue glitter all with a chalkboard background. ALL text is editable (except the number 60) so you can customize this invitation with your own party details at home using Adobe Reader (including changing my sample wording). Download links to this chalkboard 60th Birthday Invitations template will be sent directly to your inbox. 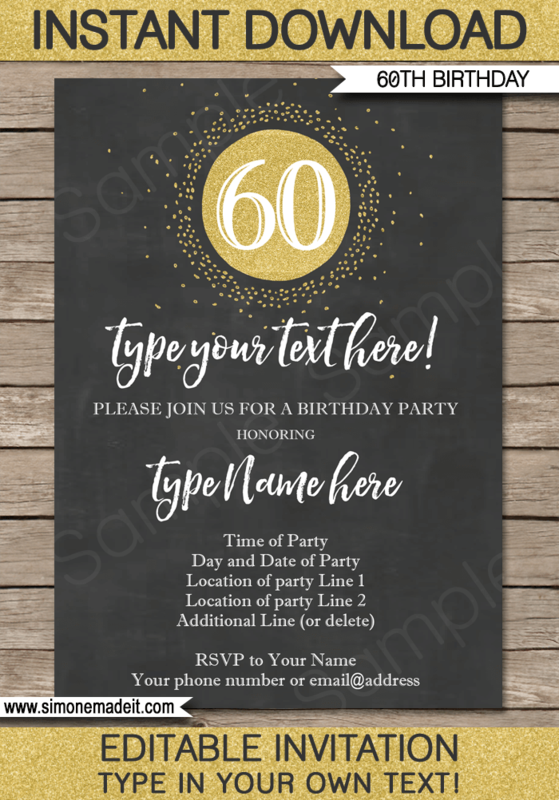 Download your chalkboard 60th Birthday Invitations template immediately after your payment has been processed. Note that you will not be able to edit the number “60” on this template. Trim out your chalkboard 60th Birthday Invitations on the provided cut lines.